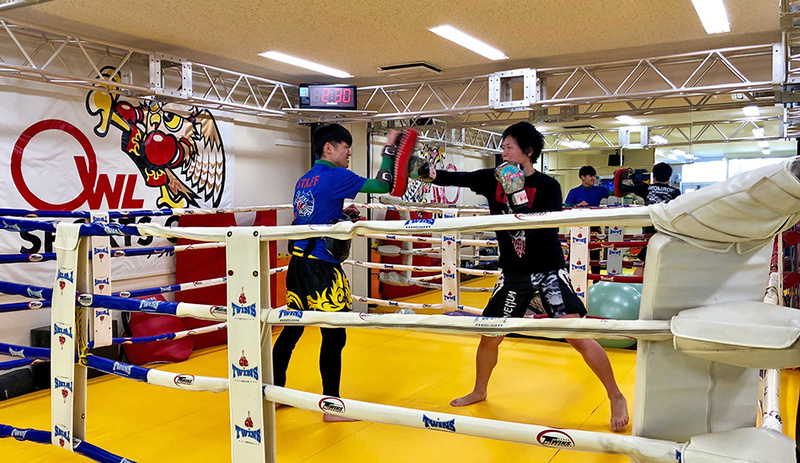 Given Japan’s extensive martial arts history it’s no surprise kickboxing has long been popular here. In recent years that popularity has increased as more women have embraced the sport for health and fitness. 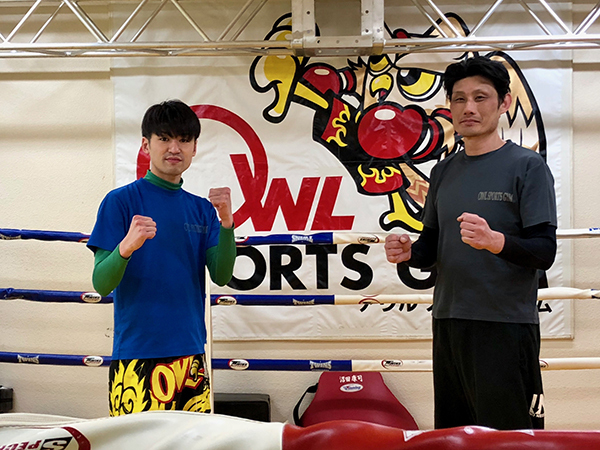 We recently dropped into Owl Sports Gym near Sumiyoshi Station for a chat with the president, Mr. Yuya Nakagawa. 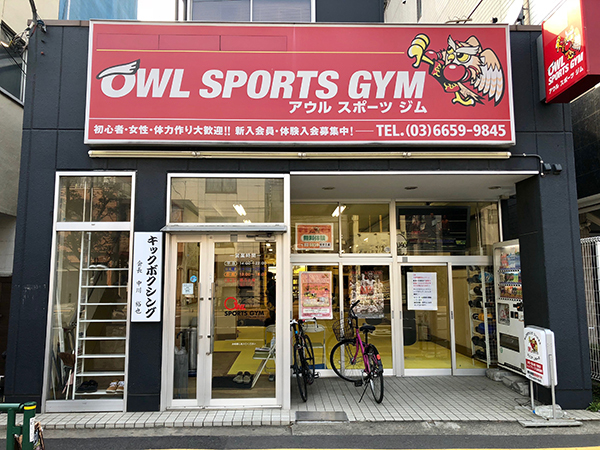 The first thing that strikes a person on entering Owl Sports Gym is how bright and spacious it appears. The ceilings are high, the walls white and the padded floor seems to absorb the sound. Secondly, and most remarkably, it doesn’t smell of sweat and old socks as so many gyms seem to do. Mr. Nakagawa seems a little nonplussed when we point this out. “Well, we do clean it a lot,” he says with a laugh. What kind of form does the training take? “The students start off with some skipping to warm up, followed by high knee exercises. 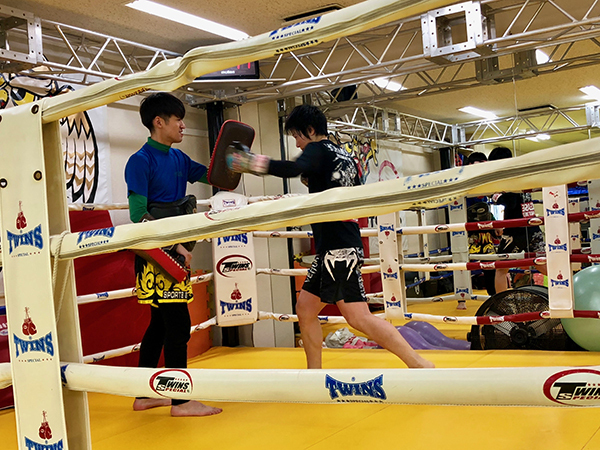 Then they practice boxing and finish off with kick training.” A young woman who fights as an amateur starts to warm up and kindly allows us to photograph her. She begins with the skipping and some stretching. 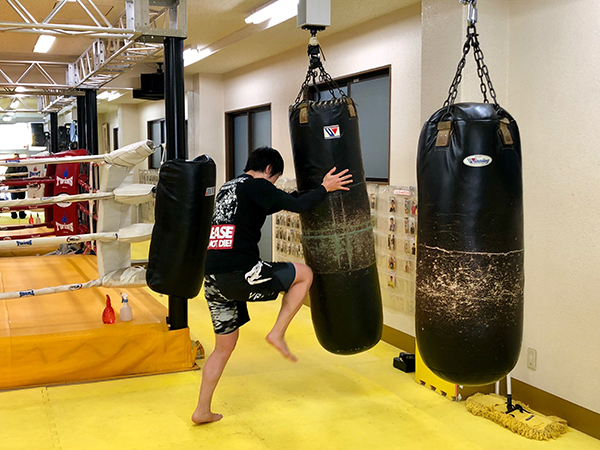 Followed by some crunching knee exercise on one of the heavy bags. After that it’s gloves on and into the ring for sparring practice with one of the trainers. Her stamina is quite remarkable. 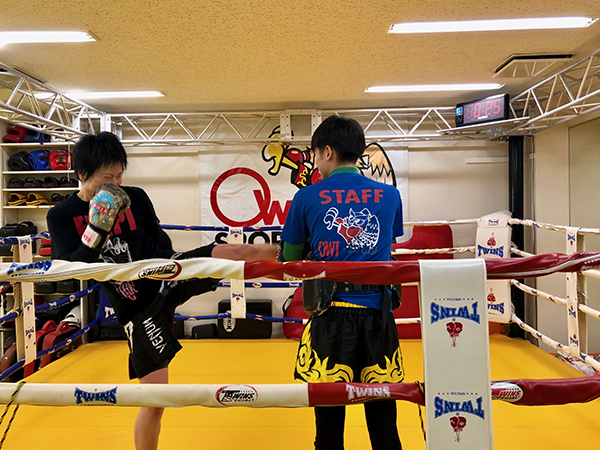 She finishes off with some sustained and powerful kick training before collapsing, laughing, onto the canvas. 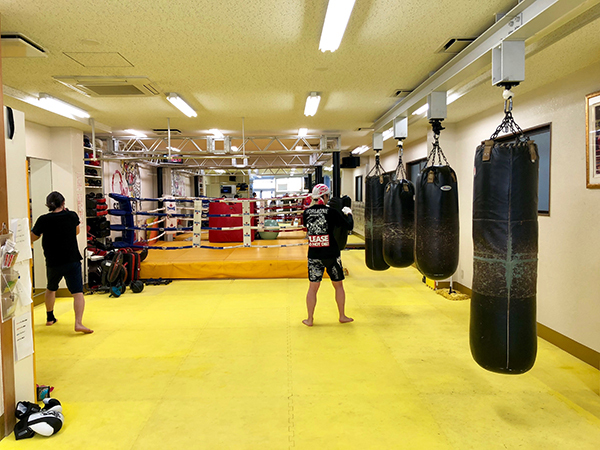 The membership fees are very reasonable: a one-time registration fee of 10,800 yen for everyone and a monthly fee of 10,800 yen for men and 8,640 yen for women. Junior and senior high school students pay 7,560 yen a month. 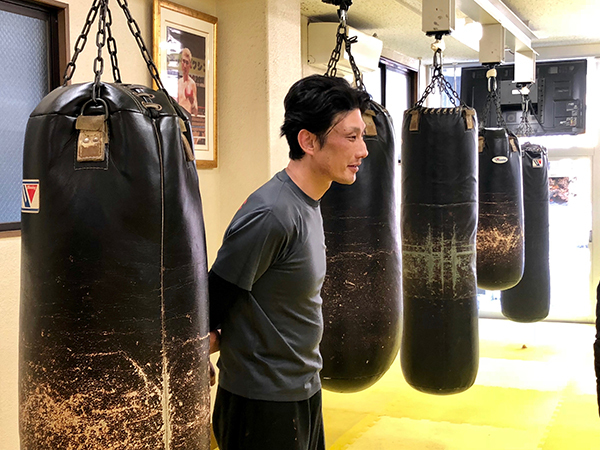 There are also special classes for middle-aged and senior students, the ladies only classes and classes for younger kids. “We’ve got students aged from 3 to 61,” says Mr. Nakagawa. 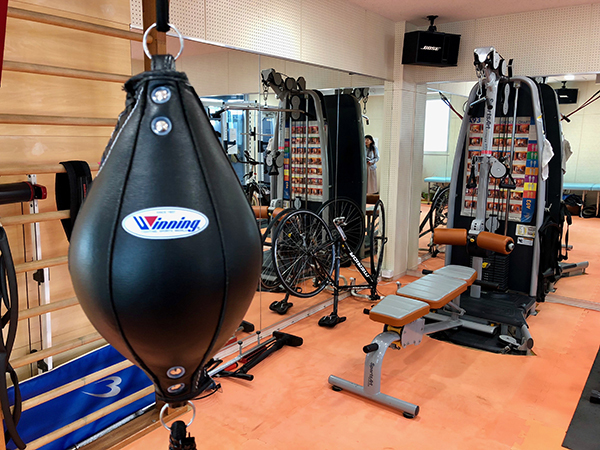 The upstairs machine training gym is available to all members at any time, as is the downstairs training area. 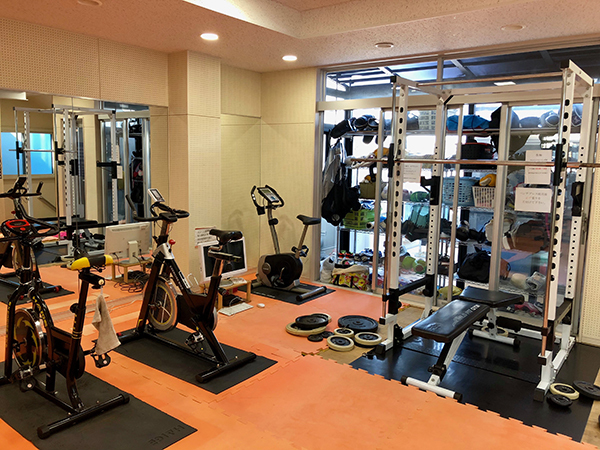 There’s a wide variety of equipment including machines, stationary bikes, free weights, speed bags, and the like. 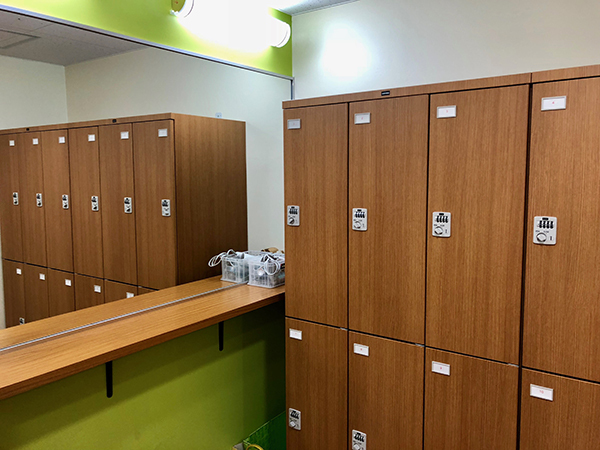 The locker room is bright and airy. 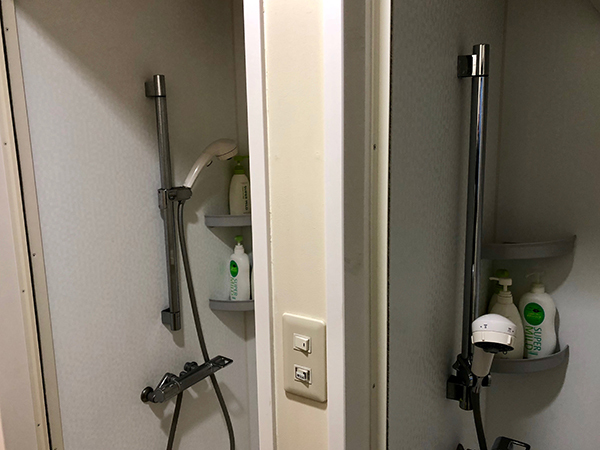 After training you can wash away the sweat in the spotlessly clean and well-stocked showers. Owl Sports Gym is open until 10pm weekday evenings, 8pm on Saturdays and 6pm on Sundays. Classes for total beginners are available on Wednesday and Friday evenings. The atmosphere was very friendly and welcoming. If you’re in the general area and interested in shaping up, then why not drop in for a look around. 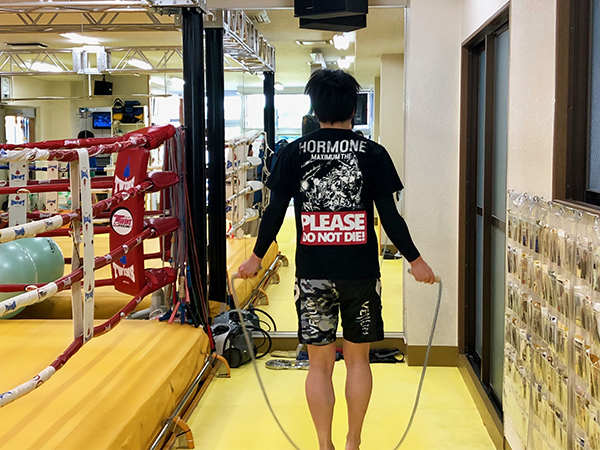 You may not become a champion like Mr. Nakagawa, but it might be the choice of a wise owl indeed.